Our primary task is to prevent loss of life and property from fire and the best way to do that is to prevent fires. Well, the best way to prevent fires is to educate people on fire safety and prevention. 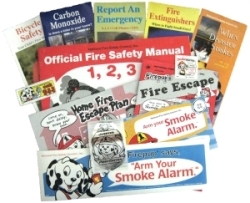 One way we do this is through the calendars distributed each year containing useful fire prevention information. Another way we educate the public is through our participation in Fire Prevention Week, observed on the Sunday through Saturday period in which October 9 falls (the anniversary of the Great Chicago Fire and the (even greater) Peshtigo Fire [from the NFPA]). Each year during fire prevention week, a group of Osseo firefighters visits Osseo Elementary and spends time educating the students about fire safety. We distrubute educational material, fire hats, and stickers sponsored by the department and local businesses. We also welcome visitors to the fire station. If you see firefighters working at the station in a non-emergency situation, please stop by and say "Hello." We'd be happy to show you the station, the trucks, and the equipment. The U.S. Fire Administration for Kids site has interactive lessons, games, and puzzles about fire safety. Wikipedia has many articles about fire, fire departments, firefighters, fire safety, and more.